A SEPTA Market-Frankford El train partially derailed Saturday morning near the Spring Garden stop. It happened around 11 a.m. The train was traveling east from Center City to the Frankford Transportation Center. It was slowly crossing over from the eastbound tracks to the westbound tracks because of maintenance work when the lead car derailed. 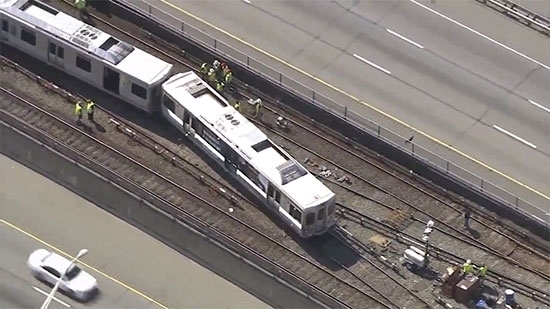 SEPTA says there were 30 people on the train at the time. One person was treated for heat exhaustion, the rest were not injured. Eventually the rails were de-energized and the passengers were led out of the train and along the tracks to the station to shuttles. SEPTA officials are investigating the cause of the derailment. The NTSB will not be responding to this incident. A multi-car accident caused major delays on the southbound lanes of I-95 this afternoon. The 9-car accident happened around 4:30 p.m. just below Allegheny Avenue. The left lanes were blocked allowing only the right lanes to get by. There were no reports of any serious injuries. The cause of the accident is still under investigation. Philadelphia-native and comedian Kevin Hart took to Instagram on Friday to announce that he plans to put 10 kids through college. "Philadelphia, I've made a decision to send ten kids to college this year. Ten kids will get an education free courtesy of Kevin Hart and HartBeat productions. I support dreamers baby. We're gonna make our presence felt." He did not specify how or who will receive the scholarships just yet. Hart said, "I'm about to start making major moves. This is the 1st of many. More information to come soon."